At DENMAC, we pride ourselves on being leaders in the creation of innovative architectural masterpieces. 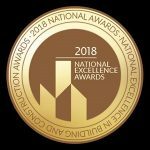 Over years, the dedication our team has put into designing, fabricating and constructing unparalleled environments has been recognised by some of the biggest names in the construction industry through some exceptional award nominations and wins. If you’d like to see what our award winning team can bring to your project, contact us today. DENMAC are proud to be representing WA at the 2018 MBA National Excellence Awards. The awards celebrate the nation’s best builders and the projects which have won them. Rob Innocent, DENMAC Managing Director said “It is a tremendous honour to be recognised nationally by the peak body in the Australian building and construction industry. Recent projects completed by DENMAC have elevated our reputation to one of Australia’s leading companies providing bespoke architectural solutions. This national acknowledgement is a testament to the talent and hard work of our team in delivering world-class projects”. DENMAC was awarded the prestigious Subcontractor of the Year award as well as Subcontractor of the Year – Cladding for work completed on Bannister Downs Dairy. The company was contracted to complete the cladding including roofing and curtain wall for the complex by Perkins Builders. Judges based their decision on quality of construction, attention to detail, relationship with the builder and other trades, degree of difficulty, innovative construction methods, safety, site and environmental management. Award judge Kevin Sale attributed the high level of workmanship to the complexity of the job, involving individually shaped aluminium panels, which were laser cut, anodized and transported from the eastern states, then fitted to the curved framework including flashings to ensure a weatherproof job. Learn more about the Bannister Downs Dairy project here. The $72 million Ngoolark building at ECU Joondalup, was named the best education building over $20 million, awarded to builder PACT Construction. DENMAC was awarded the 2015 Master Builders WA Subcontractor of the year (Facade category) award for our works on this project which comprised the Design, Supply & Installation of 2,191m2 of Alucobond Aluminium Composite (FR) & Exotec Cladding. Learn more about the ECU Ngoolark building project here. Take the journey with DENMAC today – contact us and see how we can create a project worthy of an award for you.